Baked Brie is a special-occasion favorite, and very easy to make. It goes great with sparkling and still wines and cocktails. In the spirit of the season, this easy recipe from Liren Baker of Kitchen Confidante will have guests fighting for the cheese knife. It’s a good thing this recipe makes two wheels! TIP: If you’re short of time, buy the whole cranberry sauce and only quickly the pecans in spice without candying. You’ll still have a holiday theme on top of the brie. Our recommendation is to cook the cranberries two days in advance. The sweetness of the juice and sugar needs time to penetrate the tartness of the cranberries. 1. COMBINE the cranberries, pomegranate juice and sugar in a small saucepan over medium-high heat. Bring to a boil, turn the dial to simmer and cook for 5-10 minutes, or until all cranberries have popped. 2. STIR in the pomegranate arils. Transfer to a jar with a lid; cool completely before adding the lid and placing the cranberries in the fridge. After the first day, taste and add more sweetener as desired. 3. REMOVE the cranberries from the fridge a few hours before serving; allow them to come to room temperature. 4. PREHEAT the oven to 350°F. Place the wheels of brie on ovenproof serving dishes or on a parchment-lined baking sheet. Bake for about 7 minutes, until the cheese starts to soften. Top with the honey and cranberry pomegranate sauce and return to the oven for about 2-3 more minutes, or until the brie is gooey and soft. 5. REMOVE from the oven, top with candied walnuts and garnish with rosemary. Serve warm with breads and crackers. You can candy the nuts—sugar only—or add spice for spiced nuts. 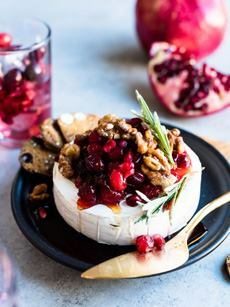 A holiday baked brie from Liren Baker of Kitchen Confidante. 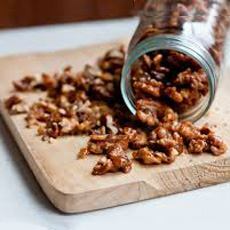 Candied walnuts photo courtesy Babble. 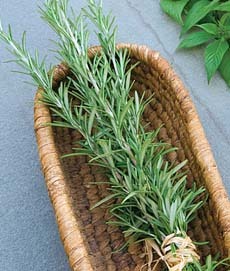 Rosemary is the “Christmas herb,” because it resembles evergreen (photo courtesy Burpee). 1. MELT the butter in a small skillet over medium-high heat. Add the sugar, stirring constantly until it dissolves. Take care that the mixture doesn’t scorch. 2. ADD the nuts and stir to coat thoroughly. Pour the nuts onto a sheet of aluminum foil and let them cool, about 15 minutes. Store up to 2 days in an airtight container. *Try this small amount and then increase the spices according to your preference.